This year is the 500th anniversary of Martin Luther’s famous act of nailing his 95 theses to the church door in Wittenberg on October 31st. This act is considered by many as the beginning of the Reformation. For Lutherans, Martin Luther’s particular witness to the gospel of Christ forms the basis of our confession and understanding of the Christian faith. So as Reformation 500 approaches this year, Lutherans all over the world are commemorating the anniversary (as opposed to celebrating) and we are trying to include brothers and sisters of other denominations, particularly Roman Catholic, where possible. As I attended the National Convention of the denomination in which I serve, the Evangelical Lutheran Church in Canada, we have been asked to consider what the next 500 years will bring for Lutherans, and all Christians. This question has been rumbling around in my mind for a long time and in a renewed way this 500th anniversary year. This is not an easy question to answer. It is deeply related to the biggest struggles of European and North American churches, most notably it relates to our experience of decline. Before getting to what I think the next 500 years will hold for us, the issue of delcine needs to be addressed. Humans have this habit of thinking that what just happened will continue happening indefinitely. We, in this North American context of Lutheranism and wider Christianity, have been experiencing churches that are dropping in membership and attendance, budgets that are getting bigger while giving is shrinking and the average age of those still in the pews and contributing is getting older. And because this is our most recent experience we assume that the future holds more of the same. But this is actually a really poor prediction model. Let me put it in different terms. Thousands reduced to less than 200. Those people back in the 50s and 60s would have laughed and laughed and laughed… But this is where we are now. So what would make people today laugh and laugh and laugh… not a prediction of more of the same. But perhaps a predication that churches will be filled once again… filled with a new spirit and new vitality that we would have never dreamed or imagined. It won’t be the 50s again, but it will be something unexpected and new. You see, we also have to think back 100 years to gain perspective. Much of North American Christianity looked similar to where we are now. There were some large and thriving groups, but lots of small communities barely able too keep up buildings, barely able to pay pastors, barely able to fund seminaries or missionaries or wider church structures. Many church groups were marginal to larger society and many churches didn’t make it and were lost to history. But think about it, society was in a time of great transition. Conflict was the story of global politics (WW1), immigration was high (settling the western part of the continent), new technologies were changing the way people lived (electricity, telephones, automobiles, modern medicine etc…). And it remained messy for nearly the entire first half of the 20th century. But this chaotic situation eventually led to many, many people seeking a truth greater than themselves, finding solace in the promises of a God who was in control when the world seemed ready to end, finding comfort in faith despite the rapid pace of new technology constantly changing the world. We don’t have to think about our current world situation very long to see the similarities, to see that our political and economic world which once seemed to provide a stability for people to live their lives on, is turning into an instability that is only going to get worse before it gets better. Most predications that I hear about the next 500 or 50 or 5 years tell us that decline will simply continue indefinitely and we are just going to have to accept that. I don’t think that the antidote to decline is to simply be better sales people for church with flashiest and shiniest features to entice largest slice of a shrinking pie of interested people into church. I think the church is about to be one of the few places of hope that many people will have to turn to in our increasingly chaotic world. I think that some political leader may just push that red button (and no it will not be like an apocalypse movie) or some aspect of climate change will be pushed over the edge, or some hacker will decide that it is time to empty everyone’s bank account… or most likely I think that through difficult struggle and resistance the average people of the world – who are sick of living under systems that privilege a small few – will decide this is not acceptable anymore. And a paired down church will have to be ready. Ready to welcome the masses who have no where else to turn for hope. The masses who no longer rely on the invisible forces of the world (governments, international organizations, corporations and civil society) to care for them. Over the coming years and decades, as most church leaders anticipate more decline, the world is going to surprise us. The world is going to surprise us by needing what the church has to offer. Let me offer and example. In 2015, the National Church Council of the denomination that I serve in the Evangelical Lutheran Church in Canada wanted to challenge our church body to 4 different ways of commemorating Reformation 500. We were encouraged to raise $500,000 for the Lutheran World Federation (LWF), to provide 500 scholarships for students in Jordan and the Holy Land, to plant 500,000 trees and to sponsor 500 refugees. Of course the council did not expect us to meet those goals, but swinging for the upper deck was better than just going for a base hit. Two years later, we have raised 150,000 for the LWF (3 times the pre “slap a zero on it goal”), we have provided 160 scholarships (3 times the original goal), and we have planted 80,000 trees (almost two times the original goal. Since 2015, and with several months to go before Oct 31, we have sponsored 540 refugees exceeding the “slap a zero on it” goal and more than 10 times the original goal! 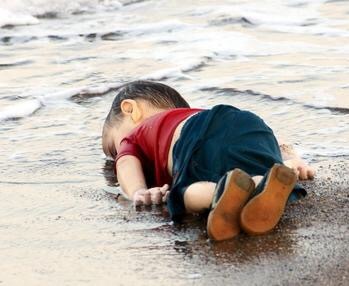 Well just a couple months after our 2015 national convention, the body of a young Syrian boy named Alan Kurdi washed up on a beach in Turkey. A boy who had been denied entrance to Canada. A boy whose tragic death mobilized the world. So did we meet our “slap a zero on it goal” because we are a church of expert refugee sponsors? Hardly. But rather the world needed what we had to offer. Which was communities small enough to care for families who needed help, but large enough to mobilize enough money, furniture, and volunteers to settle newcomers in our commmnities. All we needed to do was let our anxieties about decline die just long enough to see that God was bringing about tangible new life through us. God is using us for real resurrection. It is in this intersecting place that a declining church meets a world in need of hope. The decline of North American churches in the past few decades is not a never ending trend. But I do think God is using this time to help us shed our baggage. God is letting us struggle so that we can get all the wrong fixes and solutions to decline out of our system. So that we can try trendy music and flashy tech and hip pastors. So we can try to reincarnate the knitting groups and service clubs and curling bonspiels of the past. So that we can get all the complaining and shaming of our family, friends and neighbours over with. So that we can see that nothing we come up with will be the solution to our problems. God is letting us experience decline long enough to finally die to our memories and nostalgia of the glory days and realize that the only thing the church ever had was the good news of Christ’s death and resurrection. All we ever were at our best are communities grounded in Christ’s new life given for us. To be honest, I think in many ways the next 500 years for Lutherans and for North American Christianity will look a lot like the last 500. We will continue to be communities where the gospel is preached and where the sacraments are administered. Sometimes we will be strong in number and power. Other times we will be weak and marginalized. But in the end, neither of those realities matter. That God is answering all the sin and death in the world with resurrection and new life proclaimed in churches just like us does. My message to those who envision a secular world replacing the Christian church: Be careful what you wish for, you just might get it.